Lucky for us, Albert Einstein lived very much in the moment. In fact, he said that if he had known that people would be capturing and retelling his every word, he would have retreated into seclusion much earlier than he eventually did. And speaking of time, the timing of the current exhibition at Oglethorpe University Museum of Art could not be more serendipitous. 2015 is the 100th anniversary of Einstein's publication of his General Theory of Relativity AND the 100th anniversary of Oglethorpe University's establishment on Peachtree Road. The school's legacy dates back to 1835, first founded in Milledgeville, Georgia, which was Georgia's fourth Capital, immediately prior to Atlanta becoming the seat of Georgia State government. Oglethorpe's history is quite fascinating and the campus is stunning! 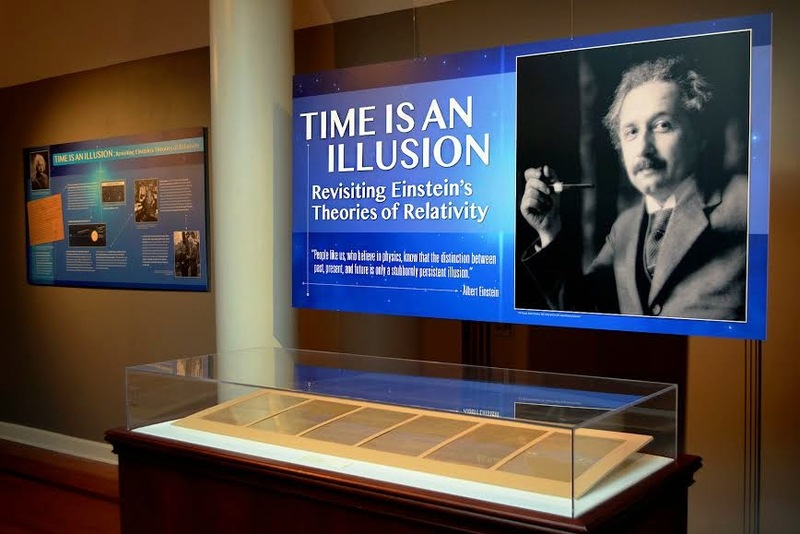 Known as the Oglethorpe-Einstein Manuscript, the original hand-written document proving Einstein's Theory of General Relativity, to help sales of his book Relativity: The Special and General Theory, is now on display at Oglethorpe University Museum of Art. Through April 30, 2015, Time is an Illusion: Revisiting Einstein's Theories of Relativity is perhaps the closest many of us will ever be to Einstein himself, other than experiencing his actual theories, day to day. In an Oglethorpe University article, authored by Ariana Feiner—a writer and student at Oglethorpe—John Daniel Tilford, Collections Manager at Oglethorpe University Museum of Art, who also is a personal friend, said, "The manuscript should be viewed in person to truly appreciate its uniqueness as each word, diagram and calculation, including a few corrections, were all penned by Einstein's own hand." In conjunction with this exhibit, there have been many special events, with more coming up. Specific to Time is an Illusion are Cosmic Dust on April 15 and The Most Gossamer Food on April 25. There's a lot more to Einstein than most would ever imagine. E = mc2 is by far the most famous equation in the world, but that's not what won Einstein the Nobel Prize in 1921. And did you know that he was a ladies man? I encourage you to have fun researching this fascinating human being. This NOVA documentary is a great place to start. I've been a science geek since my earliest childhood memories, so needless to say that I'm a happy man that in the present I, and you, can see an original, handwritten Einstein manuscript in the Time is an Illusion exhibit at the Oglethorpe University Museum of Art.